Shiraz by Berrys Bridge of Pyrenees. The full-bodied palate is rich and full with lively red berries also showing through with a touch of earth and assertive, grippy tannins. 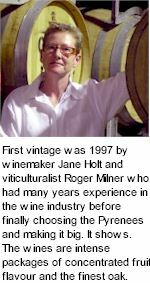 The partnership of Roger Milner and Jane Holt emerged out of a juncture in mineral exploration, eventually leading to vintages at Passing Clouds and Chateau Reynella. Located amongst the undulating foothills on the northern slopes of Pyrenees Ranges, set to an altitude of 200 metres on red duplex soils/ red brown clays. Dense and chewy yet quite refined, Berrys Bridge has developed after a spell of bottle ageing. They selected a site just outside of the main nexus of Pyrenees estates to plant vines. Ironically settling on the very terrain operated a century earlier by a Mr Berry who had also planted Shiraz. George Berry started his vineyard and orchard in 1862 on the banks of Carapooee Creek. Whilst some rootstock 110 to 140 years old can still be found, today's Berry Bridge are the fruit of plantings by Jane Holt and Roger Milner. Milner developed his passion for viticulture after several vintages at Chateau Reynella in the 1970s. He joined forces with Holt BAppSc(WineSc) & AssocDegAppSc(Wine-growing), and happily took on the challenge of re-developing the site. 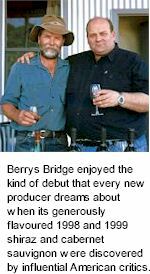 Berrys Bridge has a very limited production of three super premium Australian wines, Shiraz, Cabernet Sauvignon, and in some years Merlot. Vines were first planted in 1990, but the history of the site dates back to 1894 when a Mr Berry was growing grapes and making wine - "hermitage (shiraz) ... second to none" - from a 30 year-old vineyard on almost the same spot. The 6.5 hectare vineyard and winery is in the northern foothills of the Australian Pyrenees Ranges in the state of Victoria. Hand crafted, single vineyard wines are dry grown and vinified on site by the resident viticulturalist and resident winemaker. Hand picked fruit receives small batch open fermentation, is hand plunged and basket pressed. Wines are matured in oak barriques and are bottled on site, unfiltered, before a temperature controlled bottle storage. Rich red clay soils, warm summer days and cool nights provide lush ripe berries with intense colour, concentrated flavour and complex tannin structure. The Berrys Bridge Vineyard is favoured with winter/spring rainfall and relatively dry summers. Good canopy management generally minimises disease impact in this mild climate, and the ecologically friendly option is always chosen when selecting vineyard inputs. Many species of insect-eating birds love the habitat contributing to a healthy and diverse environment.